According to the 2009/20010 American Pet Products Association’s National Pet Owners Survey, on average dog owners will take their pet on three car trips per year and cat owners will take their cat on five car trips per year. Now, pet product manufacturers make everything under the sun to make a trip with your pet safer, more convenient and enjoyable. 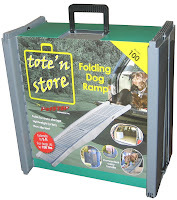 * The Tote’N Store by PetSTEP International sets a new standard for portability in the Pet Ramp category. Weighing in at a mere 6 lbs and opening to 5 feet in length when fully unfolded, Tote’N Store is the easiest ramp to carry and store. The Tote’N Store will fit in virtually any vehicle, leaving plenty of room for people, pets and cargo and is especially great for medium to small dogs that have difficulty jumping due to age, recent surgery or other physical factors. It is also perfect for elderly consumers who have trouble lifting their dogs or handling larger, bulkier ramps. www.petstep.com. * Relaxed Dog Travel Calm Formula by Veterinarian’s Best helps reduce stress and tension caused by travel or loud noises, including those caused by fireworks and thunder. Travel Calm also helps ease any discomfort caused by motion, and is all natural. This is great for pets that may not be so comfortable with traveling. The formula contains Ginger, Valerian Root, Tryptophan, Pyroidoxine (Vitamin B6), Potassium and Magnesium and comes in 40 chewable tablets. www.vetsbest.com. * The Skybox Booster Seat by Kurgo offers a safe and secure way for Fido to accompany you in the car. The Skybox Booster Seat straps on to the car seat and provides an elevated view out the window for the important pup. The Booster Seat safely straps pets in for minimal distraction to the driver and safe travels for your pup. www.kurgo.com. 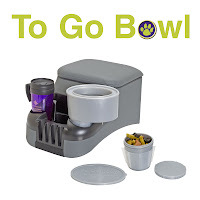 * The To Go Bowl by Furry Travelers is a great travel bowl for both cats and dogs. This plastic water bowl, available in many different colors holds up to a liter of water and fits snugly into most cars’ cup holder consoles, allowing dogs and cats to drink at their own leisure throughout the trip. The To Go Bowl even has a splash-guard to prevent spills and a removable cup holder base to store your pet’s favorite treats! Not only is the To Go Bowl perfect for cars, but also boats, RV’s and even golf carts. www.furrytravelers.com. * Travelin’ Dog Carrier is a soft sided carrier which fastens directly to a car’s seat belt. It is versatile and can even convert the pet seat into a carrier. It also features a direct seat belt to dog hook up which allows the front of the carrier to be open for a less confined feel. www.goodpetstuff.com. * The Hydro-Go by Veterinary Ventures is the perfect accessory for outdoor camping and hiking trips with your pet. 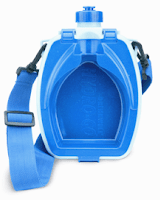 It is the first and only pet canteen with a fold-out funnel bowl. The bowl and canteen work together to form a funnel, easily allowing any unused water to be poured back into the canteen. The Hydro-Go™ is a great product for those who enjoy hiking, walking, camping, fishing, hunting, car trips, visits to the park or any other place you and your pet may go. More importantly, it ensures that you have enough water when you and your pet are away from home! www.petfountain.com.